Until now, Michael Jackson’s art collection was shrouded in mystery. It was said to be stuck in a legal dispute over possession. Then, people speculated that buyers such as Cirque du Soleil’s Guy Laliberté were interested. It’s been valued at the staggering (and slightly unbelievable) sum of $900 million. One crucial fact: Jackson’s art collection isn’t art by other people — it’s mainly drawings and paintings that he created himself. So what does that art look like? Yesterday, LA Weekly was the first to visit the (until now) top-secret Santa Monica Airport hangar that Jackson used as his studio and art storehouse. The collection is currently owned by Brett-Livingstone Strong, the Australian monument builder and Jackson’s art mentor through the years, in conjunction with the Jackson estate. Though the entire art collection has been mired in disputes and battles for rights, Strong claims that he is working with everybody — the family, the estate, as well as others — to exhibit and publish as much of Jackson’s work as possible. According to Strong, he and Jackson formed an incorporated business partnership in 1989, known as the Jackson-Strong alliance. This gave each partner a fifty-percent stake in the other’s art. In 2008, Strong says, Jackson requested that his attorney sign the rights to Jackson’s portion of the art over to Strong. Now, Strong is beginning to reveal more and more of the art as he goes ahead with Jackson’s dream of organizing a museum exhibit. Some of Jackson’s original drawings hanging on the wall. Prints of these were donated to the L.A. Children’s Hospital. The current design is still in the works, but it’s conceived as an interactive monument — fans who buy a print by Jackson will receive a card in the mail. They can scan this card at the monument, and then have a computer organize a personal greeting for them, or allow them to book it for weddings. Jackson initially thought it would be perfect for Las Vegas, but Strong says that Los Angeles might have the honor of hosting it — apparently, Mayor Antonio Villaraigosa recently paid a visit and made a few oblique promises. As for Jackson’s art, the contents of the hangar barely scratched the surface of the collection, as Strong estimates Jackson’s total output at 150 to 160 pieces. A few large pieces hanging on the walls had been donated as reproductions to the L.A. Children’s Hospital last Monday, along with other sketches and poems. Jackson, who was a technically talented artist — and completely self-taught — fixated on these motifs, elevating everyday objects into cult symbols. Strong added that Jackson’s sketchbooks are completely filled with studies of his favorite objects, in endless permutations. MJ’s portrait of George Washington — he initially planned to do a series of all of the presidents, but never continued it. 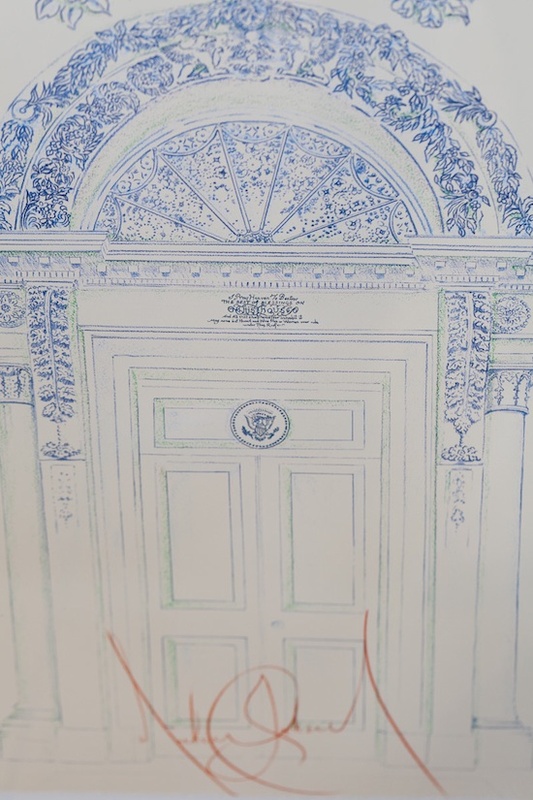 But Jackson also created portraits: a small sketch of Paul McCartney, and a large drawing of George Washington, created as Strong was working with the White House to commemorate the bicentennial of the Constitution back in 1987. He also sketched self-portraits — one as a humorous four-panel drawing charting his growing-up process, and a darker one that depicts him as a child cowering in a corner, inscribed with a sentence reflecting on his fragility. As an artist, Jackson preferred using wax pencils, though Strong adds, “He did do a lot of watercolors but he gave them away. He was a little intimidated by mixing colors.” Some surviving pencils are archived in the hangar; Strong moves over to a cabinet on the far wall of the hangar and pulls out a ziploc bag containing a blue wax pencil, a white feathered quill and a white glove that Jackson used for drawing. Jackson turned to art as times got hard for him. “His interest in art, in drawing it, was just another level of his creativity that went on over a long period of time,” Strong says. “It was quite private to him. I think he retreated into it when he was being attacked by those accusations against him.” The sketches and drawings certainly reveal an extremely sensitive creator, though it’s clear that Jackson also had a sense of humor. Jackson’s art was kept under wraps for such a long time simply because of the scandal, which erupted right around the time that he was looking for a way to publicize the works. “A lot of his art was going to be exhibited 18 years ago. Here’s one of his tour books, where he talks about exhibiting art. He didn’t want it to be a secret,” Strong says, pointing at a leaflet from the 1992 Dangerous World Tour. Prior to that period, Jackson and Strong had met and become fast friends. This marked the beginning of Strong’s mentorship, in which he encouraged Jackson to create bigger paintings and drawings, and exhibit his work. The idea behind their Jackson-Strong Alliance was that Strong would help Jackson manage and exhibit his art. Notably, the alliance birthed Strong’s infamous $2 million portrait of Michael Jackson entitled The Book, the only known portrait Jackson ever sat for. In 1993, everything blew up. At the time, Jackson and Strong were both on the board of Big Brothers of Los Angeles (now known as Big Brothers Big Sisters), a chapter of the national youth mentoring organization established in L.A. by Walt Disney and Meredith Willson. They had planned out a fundraising campaign involving Jackson’s art. Strong explains, “We thought that if we would market [his art] in limited edition prints to his fans, he could support the charities that he wanted to, rather than have everybody think that he was so wealthy he could afford to finance everybody.” When the scandal erupted, Disney put a freeze on the project. The artwork stayed put, packed away from public eyes in storage crates. As for the spectacular appraisal of $900 million for Jackson’s art collection, Strong says that it derives from the idea of reproducing prints as well. The figure was originally quoted by Eric Finzi, of Belgo Fine Art Appraisers. “The reason somebody came out with that was because there was an appraisal on if all of his originals were reproduced — he wanted to do limited editions of 777 — and he would sell them to his fan base in order to build his monument, support kids and do other things. You multiply that by 150 originals, and if they sold for a few thousand dollars each, then you would end up with 900 million dollars.” Fair enough, though now Strong says he has gone to an appraiser in Chicago to get that value double-checked, and they arrived at an even higher estimate. The story of Jackson’s art ends up being quite a simple one, though confused by so much hearsay and rumor. Strong and the Jackson estate will slowly reveal more works as time passes, and an exhibit is tentatively planned for L.A.’s City Hall. Negotiations with museums for a posthumous Jackson retrospective are still underway, but Strong has high hopes. He’s even talking of building a Michael Jackson museum that would house all of Jackson’s artwork. He was in a very light and happy mood most of the time. He would have the oldies on, and sometimes he’d hear some of his Jackson Five songs. He’d kind of move along to that, but most of the time he would change it and listen to a variety of songs. He liked classical music. His inspiration to create was that he loved life, and wanted to express his love of life in some of these simple compositions. Michael Jackson’s dedication to art: so strong that he’ll end up perched on a kitchen island. This entry was posted on August 17, 2011 by Andrea. It was filed under Uncategorized and was tagged with Achievements, Biography, Fans, legacy, pics, talents.